Pineapple Sage should be called Hummingbird Highway. Its profuse bright red tubular flowers and its attraction to hummingbirds are reason enough to plant this late season bloomer. Pineapple Sage does have a pineappley fragrance, but it's only real use in cooking is as a fresh edible flower. The flowers are reminiscent of Honeysuckle and make a colorful addition to salads, fruit cocktails or any garnish. They are particularly attractive with yellow or green bell pepper. They can be sugared and used to garnish cakes or cookie platters. 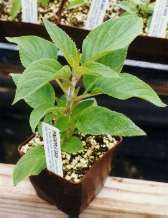 When planted in early spring, after danger of frost, Pineapple Sage grows quickly from a three inch pot. The photo on the right was taken four months after planting. 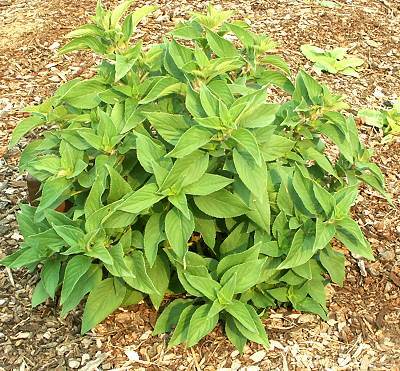 The Pineapple Sage has grown to about three feet in diameter and measures about two feet high. Soon it will be covered in long flower spikes filled with red flowers. After blooming, we will cut it back to the ground where it will rest for winter. It will emerge from the ground in spring and grow bigger in diameter. Because Pineapple Sage does grow quickly, it makes a suitable annual for those with cold winters where it won't survive. One of the best plans for a successful garden is to plant many different kinds of plants. This ensures that beneficial insects will be lured to the garden to do battle with bad bugs like aphids and spider mites. 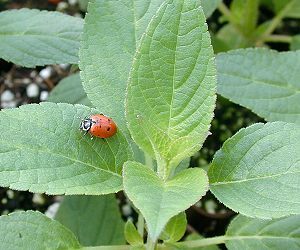 The ladybug on this Pineapple Sage leaf is paroling the plant looking for food. Salvias tend to attract aphids in early spring. We find though that by mid-spring the ladybugs have completely gotten rid of the pesky aphids. If we sprayed the aphids, the ladybugs would not come because they would have no food. 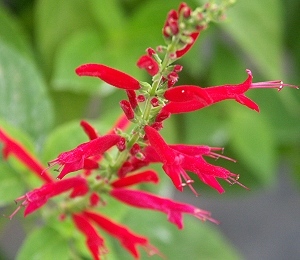 Pineapple Sage is one of the six plants chosen to be in our Edible Flower Herb Garden Six Pack and in our Zone 8-11 Fragrant Herb Garden Six Pack. This plant is often available in plug trays. These trays hold 128 of all the same plant. They are a great low cost way to fill a lot of space. Each cell is 3/4 of inch by an inch. Check here to see if Pineapple Sage Plug Trays are available.